Recently Vodafone have caused us nothing but hassle. Their customer service has been awful to say the least and their customer care has been invisible. Vodafone run a business where all your problems are brushed under the carpet and if you have a query about anything related to their business, they will pass you to anyone who works at their company but never directly answer or sort an issue out. Today I want to share my own experience about Vodafone and why I would never recommend using them. Around a year and a half ago, Ben and I took contracts out with Vodafone At the time we were promised that we would get the best deal and we would also get 4G, 3G, 2G to use at home - inside and outside. Having been promised this, we moved away from O2 who we had been with for years and put our trust into Vodafone. We were put on business contracts, and to this day we still do not understand why as the phones are for both our personal use however at the time we accepted the contracts. Within a few days of being with Vodafone my phone broke. I had not misused the device and at the time I wanted to cancel the contract there and then, however I was sucked back into keeping the contract with them and this is how it stayed. A few months ago, we began to have problems with our signal at home. We are unable to make any phone calls from our home due to the line cutting and texts were not being delivered to us or the recipient. Due to the problem we were having, we put our concerns over to Vodafone who told us that we should be getting 4G coverage at home, and made out that we were lying when we said that we were only getting 3G at most and we were unable to use it due to the poor signal we were getting off their network. A few more months went by and we complained and complained about the coverage. At this point, we were using our home phone to make calls. As you can imagine this was a costly expense to us and by this point we had had enough. Ben and I pay over £35 each for our contracts a month for unlimited minutes, texts and internet. At home we were unable to use barely any of these features that we were paying for. What were we paying £35 each out for when we were unable to use Vodafone's services at home where we spend a lot of our time? Everything came to a head last week when we had 3 power cuts in 1 week. Having my phone and being able to use it was important to me when we had no power supply for 6 hours at a time. However due to Vodafone's services I was unable to contact anyone and they were unable to contact me. At 3am one morning when our power supply went down, I had to stand outside in the dark to reach the power grid to alert them of the problem of us having no electric. How is this right? On Monday evening Ben went on live chat to Vodafone. First of all they said there should be no issue with using our phones at home, after a lot of going back and forwards we were then told that we needed to change our phones to only being able to use 3G. Although we tried and it did not work, if it had, why should we be using 3G when we were promised and pay the price of using 4G? Eventually after a lot of time on live chat we were told that we either needed to swap phones due to their being a fault with them (we have 2 different phones made by 2 different brands so how could we both have issues?) or we could buy a signal booster for £69. At this point I was disgusted. Why should we have to fork out £69 to use a service which we already pay for? At this point I decided I wanted to talk to a human - face to face and I was especially keen to speak to a manager. On Tuesday we went to Southampton town centre. Once again, we paid petrol to get there and paid for parking, just so we could resolve our issue with Vodafone's non existent services which we were paying for. Ben and I reached Southampton's High Street Vodafone branch and were greeted after a little wait by a lady who had no intention of wanting to help. We directly asked to speak to a manager in the store in which she refused. We then explained our issue to her and she told us she was unable to help us with the issue and that we would need to ring customer services as she could only deal with sales. We questioned why and she said she was a sales adviser and could not help. At this point we left. Who knew a sales adviser who worked for a global company could only help with sales and not complaints in any nature? Not wanting to give up, Ben and I went into West Quays Vodafone branch where we spoke to a boy behind a desk who had no manager role. Instantly I knew we were wasting our breath with Vodafone as I again repeated the issue with the network and asked could I speak to the manager in charge. I was told that they was busy and I was advised I was unable to speak to a manager as the manager would tell me exactly what the boy was telling me. The boy went on to tell me that the staff in the shop were sales advisers and were unable to help with any network problems, however we could buy a signal booster for £69 off him. At this point I could have screamed the shop down. I was frustrated, let down and irritated. In the end I went around the houses with the sales adviser who offered very little help, any compassion and actually said to me "what do you want me to do". He told us that he would set up WIFI services for our phones and we would both receive a text within a hour giving us instructions of what to do. To this day this has not been provided to us. In the end, all the sales adviser could actually offer me was a piece of paper with Ofcom's number on. 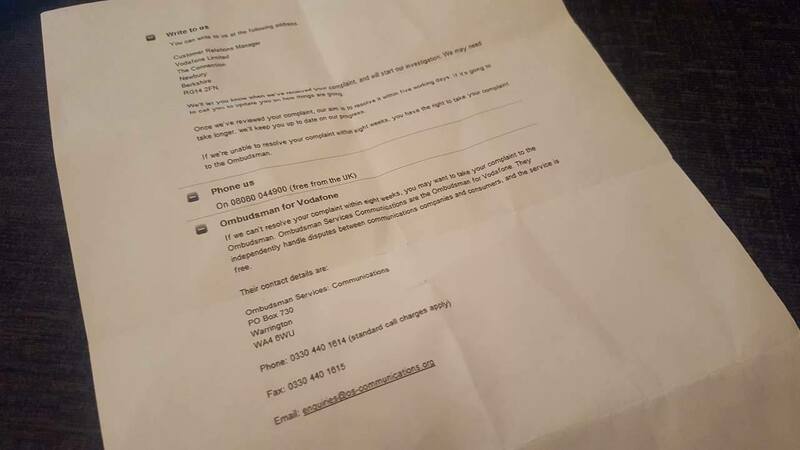 We were told to contact them about the poor service and network coverage we were receiving from Vodafone. So there you have it. No one can help us and Ofcom are our only hope. 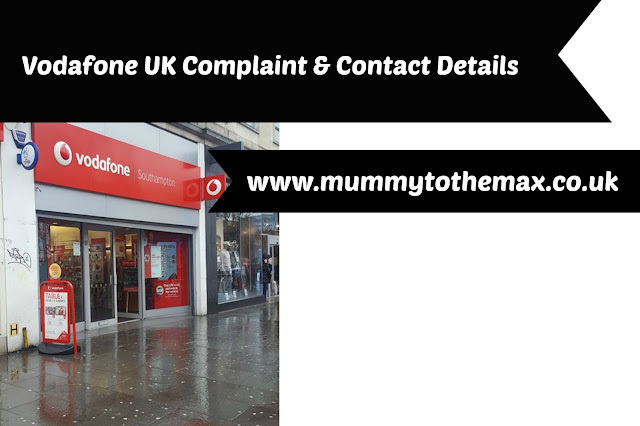 In 2017 Vodafone run a company who are happy to take your money, rob you of your hard earned money, offer no customer service and essentially can not be bothered with any complaints you may have so direct you to Ofcom. Ben and I will both be contacting Ofcom and thankfully we only have 6 months left of our contracts so will be jumping ship from Vodafone as soon as possible. I hate the fact that I even have to give this disgusting company any air time but I hope this post is seen by many. If you are reading this, please never entertain a company known for poor customer service. I have wasted hours trying to use a service which I pay for and to this day Vodafone offer very little in terms of help. I will publish this post to Vodafone on social media and I will direct this post to their CEO office. I welcome any help in reference to my long complaint and I will update this post if I receive any help from the people of Vodafone. - UPDATE - After contacting Vodafone at their head office, they were keen to help me with the issues I was having. After speaking to them, they agreed to send me a Signal Booster - free of charge. After speaking to Vodafone's head office, I felt they listened well and helped me with my concerns. The signal booster does indeed boost our signal and I am now able to receive calls at home! Have you had any poor experiences with Vodafone? I am keen to hear from you.